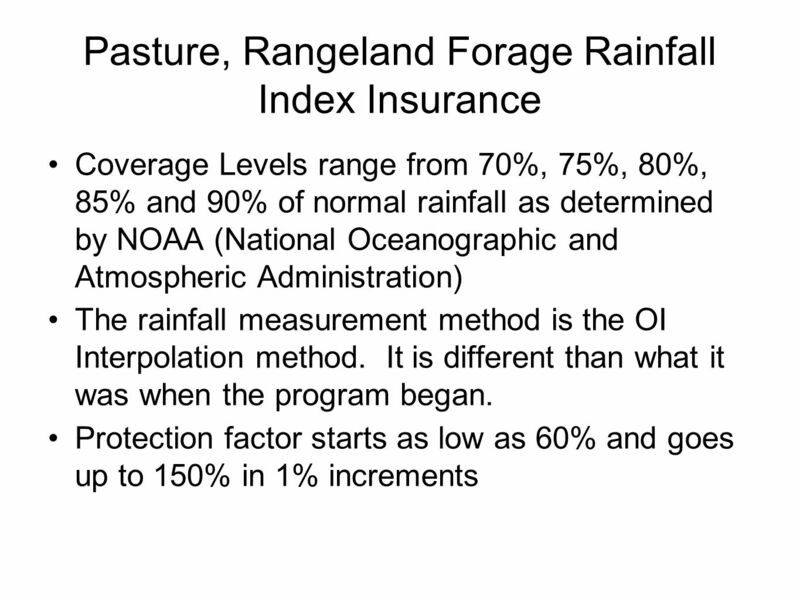 Pasture, Rangeland Forage Rainfall Index Insurance Insures the average rainfall in a 12 mile x 12 mile grid area as set up by program Choose area where. 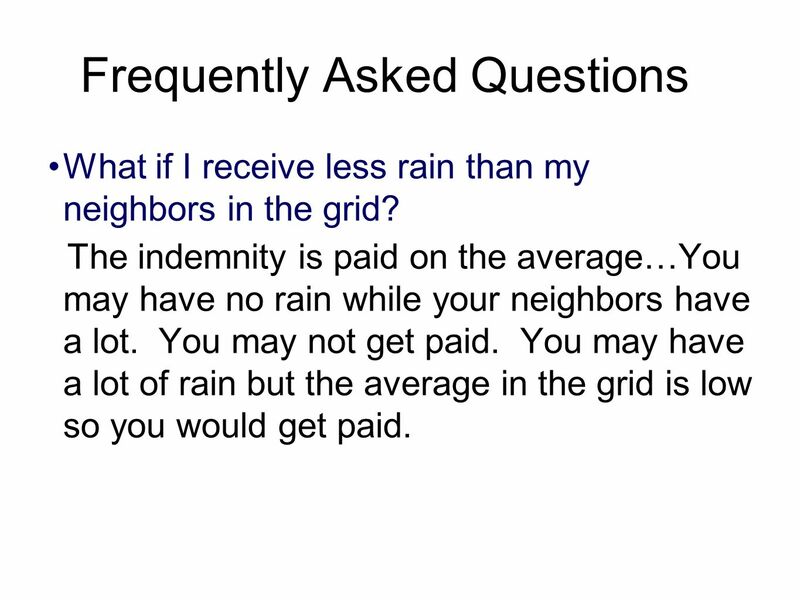 8 Frequently Asked Questions What if I receive less rain than my neighbors in the grid? 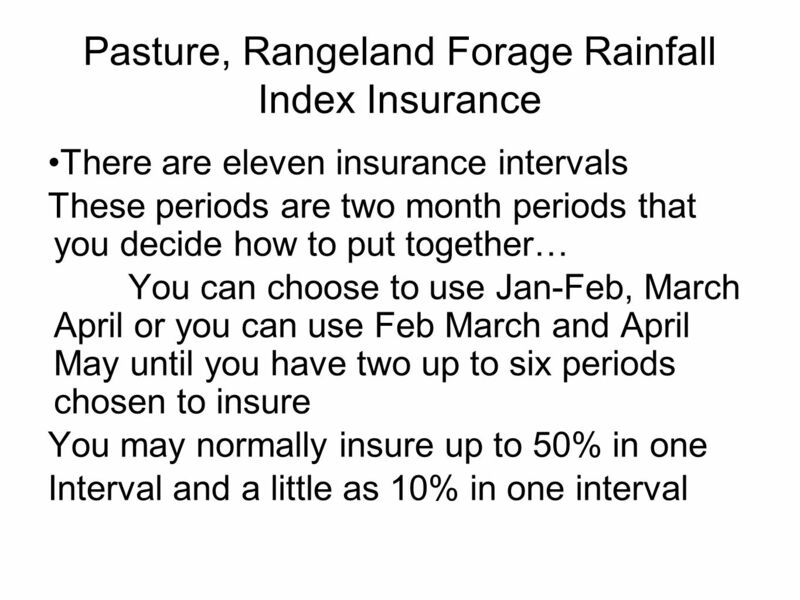 The indemnity is paid on the average…You may have no rain while your neighbors have a lot. You may not get paid. You may have a lot of rain but the average in the grid is low so you would get paid. 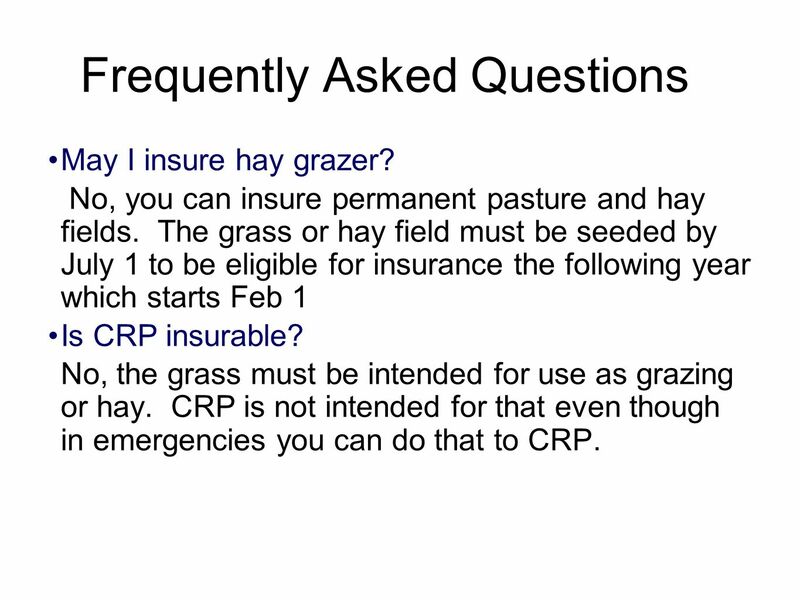 9 Frequently Asked Questions May I insure hay grazer? 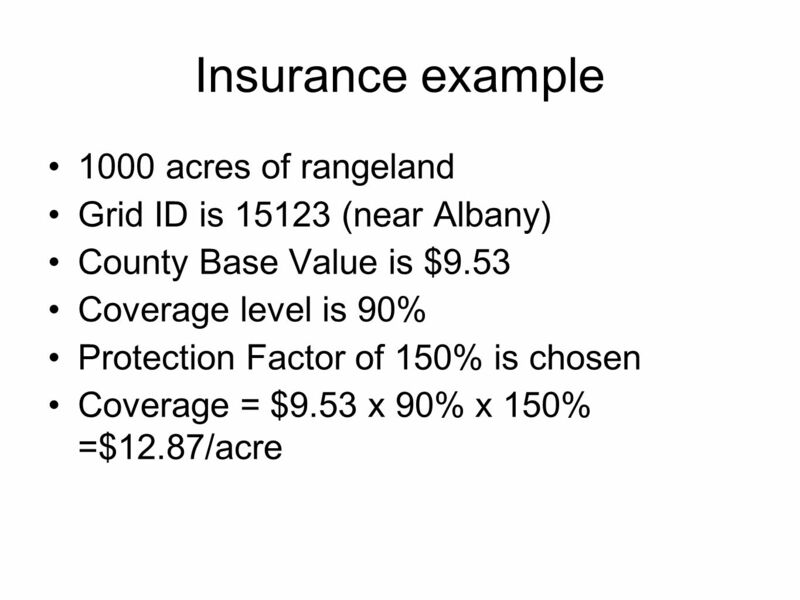 No, you can insure permanent pasture and hay fields. 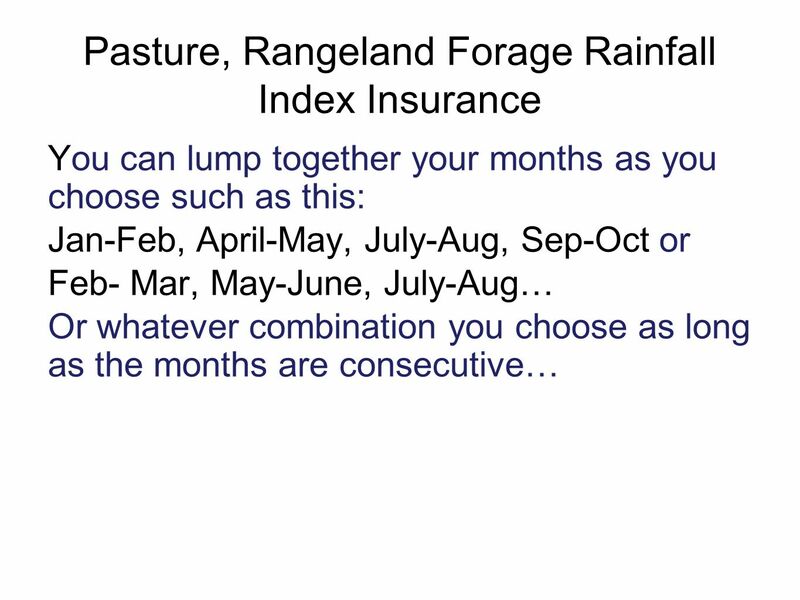 The grass or hay field must be seeded by July 1 to be eligible for insurance the following year which starts Feb 1 Is CRP insurable? No, the grass must be intended for use as grazing or hay. CRP is not intended for that even though in emergencies you can do that to CRP. 10 Frequently Asked Questions When is my premium due? Premium billing date is July 1. If any of the intervals have a loss then your premium will be deducted from the loss. 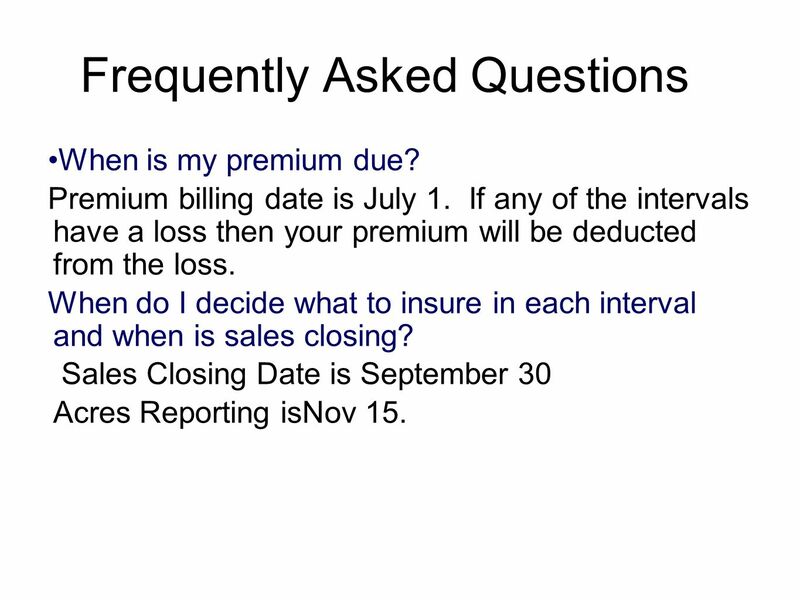 When do I decide what to insure in each interval and when is sales closing? Sales Closing Date is September 30 Acres Reporting isNov 15. 11 Frequently Asked Questions How can I determine if this will work for me? 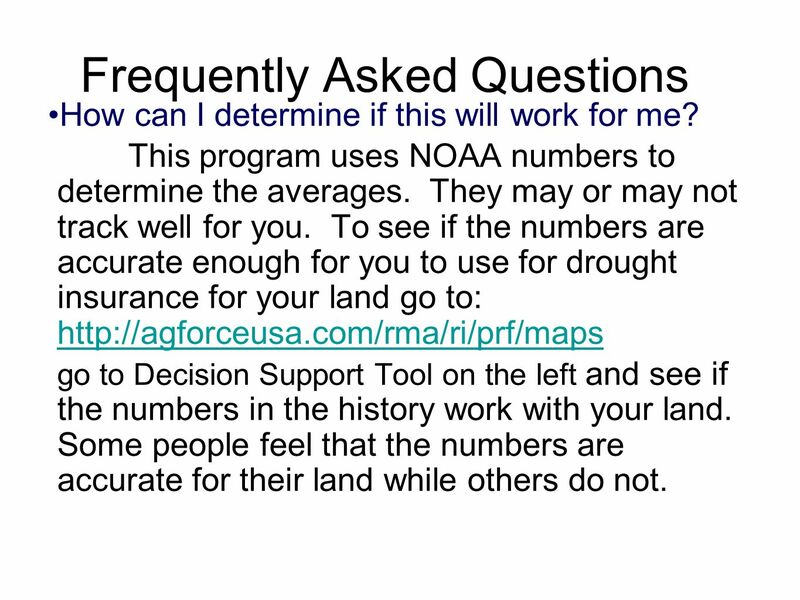 This program uses NOAA numbers to determine the averages. They may or may not track well for you. 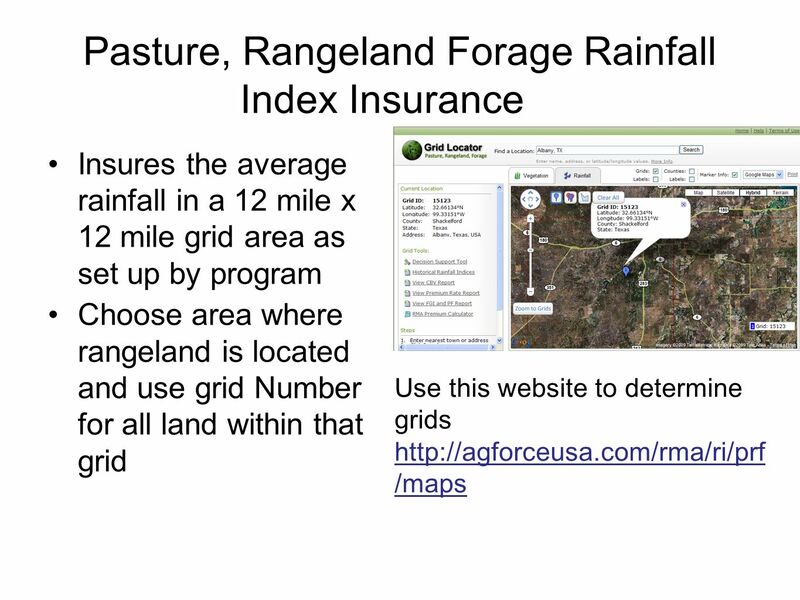 To see if the numbers are accurate enough for you to use for drought insurance for your land go to: http://agforceusa.com/rma/ri/prf/maps http://agforceusa.com/rma/ri/prf/maps go to Decision Support Tool on the left and see if the numbers in the history work with your land. Some people feel that the numbers are accurate for their land while others do not. 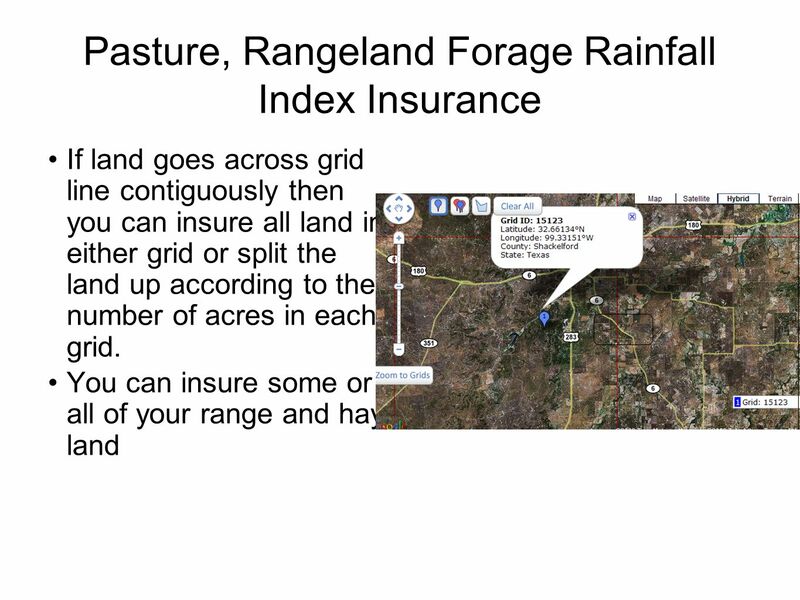 Download ppt "Pasture, Rangeland Forage Rainfall Index Insurance Insures the average rainfall in a 12 mile x 12 mile grid area as set up by program Choose area where." How to create a climate graph?. Step One: Draw on three axis. Human Resources New Look Local Government Pension Scheme 2008 An overview of the changes. Activity 1: BROADENING OUR HORIZONS. WHERE TO GO? 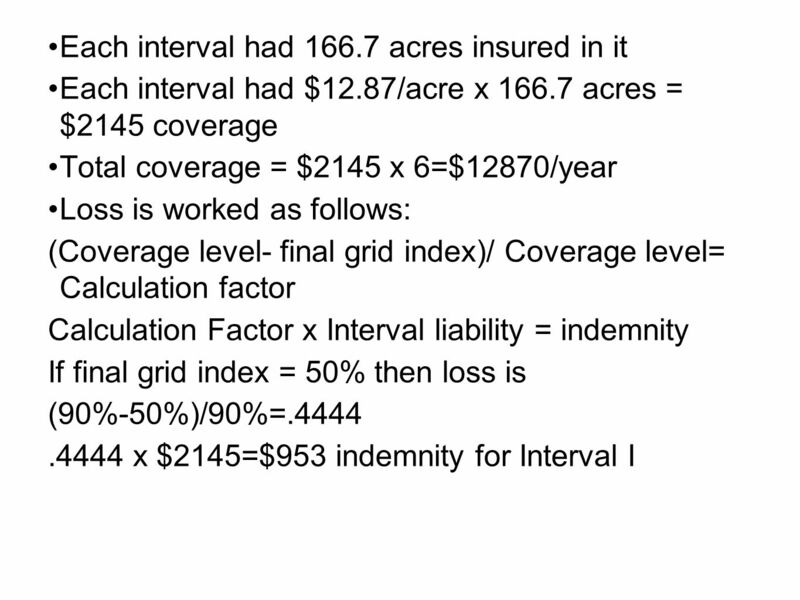 Multiple Peril Crop Insurance (MPCI). Actual Production History (APH)Yield Insurance APH yield is average of past 10 years. APH yield is average of past. Risk Management Programs for Forage and Livestock Producers Dr. Curt Lacy Extension Economist-Livestock University of Georgia. 1 Production Risk Management: Running With The Bulls Gary Brester MSU Department of Agricultural Economics and Economics May 6, 2008 Current Dynamics in. Bowls – A Sport for Life 69 Metropolitan Bowling Clubs read Jack Hi 140 Country Bowling Clubs read Jack Hi Hundreds of Community Members across the State. Commonwealth Connector Pharmacy Benefits July 12, 2007. CE Electric UK – Potential developments in long-term charging arrangements and IDNO charging methodologies 1 April 9, 2008 Potential developments in long-term. Department of Economics Disaster Programs & Crop Insurance Unpacking The 2008 Farm Bill 2008 Breimyer Seminar Columbia, Missouri Sept. 3, 2008 Chad Hart.